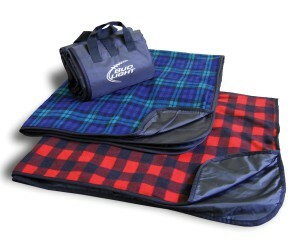 OUR BEST SELLING PICNIC BLANKET! 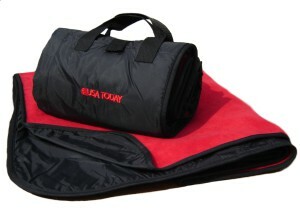 Great for sporting events, picnics, outdoor concerts, and more! Style #WP450 50″ x 60″ fleece blanket features a black nylon waterproof backing with pocket. The blanket rolls up into itself and is secured with a Velcro® closure and handles. Shown in Blackwatch Plaid and Red Buffalo Check. Solid colors include Red, Navy, Royal, Hunter, Gray, Black, and Pink. Pocket measures 11″ wide by 8″ tall. Style #WP450 Price: $10.90 ea. 36 – 71 Pcs. 72 – 287 Pcs. 288 – 599 Pcs. 600 – 1,199 Pcs. Tape Charge: $15.00 per 1,000 stitches. None if a digitized file is provided. Please refer to the Artwork Requirements page for specifications.